In 2010, the median after-tax income for lone-parents in Canada was $39,900. Lone parents in Nova Scotia ($42,200), Ontario ($40,600), Alberta ($44,800), and British Columbia ($40,400) had after-tax incomes above the national average. 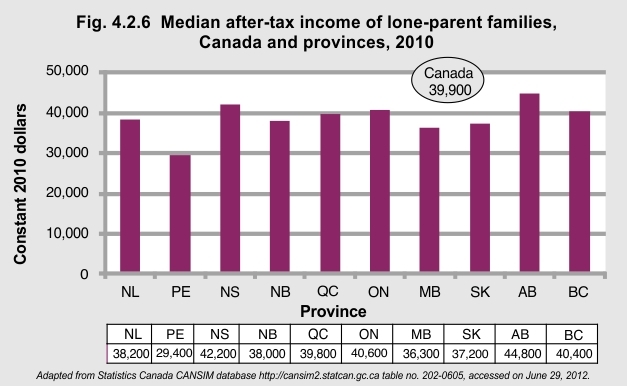 Prince Edward Island ($29,400) and Manitoba ($36,300) had the lowest lone-parent family incomes. The median after-tax family income for Prince Edward Island was 36% below the national average.